The Bakersfield Condors of the American Hockey League will have blackout cancer night on Feb. 16 when they host the Ontario Reign at the Rabobank Arena (Tickets). One lucky fan will have a chance to win a special Condors blackout cancer jersey and the Condors will also be auctioning off these jerseys with proceeds going to the Kern County Cancer Fund. This is a marvelous time to watch the Condors. They are the hottest team in the AHL and have now won a remarkable nine straight games. Their ninth straight win came on Feb. 1 as the Condors beat the Iowa Wild 4-2. Three Condors recorded multi-point games as assistant captain Joe Gambardella notched two goals and Ryan Spooner and David Gust notched one goal and one assist each. The Condors are currently in second place in the Pacific Division with 53 points. They have a record of 25 wins, 15 regulation losses, two overtime losses and one shootout loss. The Reign are in last place in the Pacific Division with a record of 13 wins, 21 regulation losses, four overtime losses and two shootout losses for 32 points. The Condors' leading scorers are Gambardella and Tyler Benson, who each have 34 points. Gambardella has 21 goals and 13 assists and Benson has five goals and 29 assists. The Reign leading scorer is Matt Moulson, who has 18 goals and 17 assists for 35 points. In Condors news, two Condors received significant accolades this past week. Cooper Marody was the AHL rookie of the month for January and Gambardella was the AHL player of the week for the time period from Jan. 21 to Jan. 27, 2019. Marody had three goals and 10 assists for 13 points, including a seven-game point streak from Jan. 9 to Jan. 21. He also becomes the first Condors player ever to be named AHL rookie of the month. Gambardella meanwhile had four goals and two assists for six points in four games. Two of his four goals were game-winning goals. 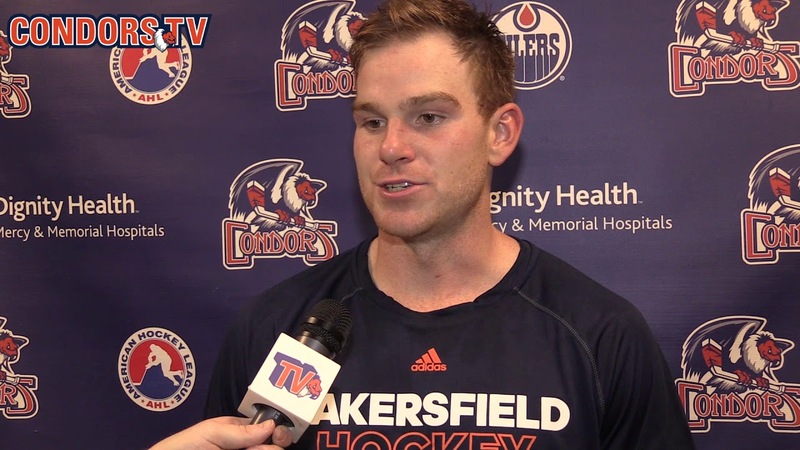 Meanwhile, the Edmonton Oilers called up center Brad Malone from Bakersfield on Jan. 31. In 41 games with the Condors, Malone has seven goals and 17 assists for 24 points. The Oilers must also like Malone's defensive zone coverage as he is a +8. Malone has 183 regular season games under his belt with the Oilers, Colorado Avalanche and Carolina Hurricanes. He has 13 goals and 17 assists for 30 points. Get your tickets to see the Bakersfield Condors and the Ontario Reign on Feb. 16 at the Rabobank Arena today!